Prawns are found along the Pacific coast of North America from Alaska to southern California. Their range also extends to Asia, with significant populations off the coasts of Korea and Japan. 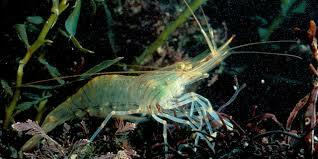 Prawns live in subtidal sandy and rocky habitats, at ocean depths ranging from the intertidal zone to 400 metres below, but normally at a depth of at least 70 metres. 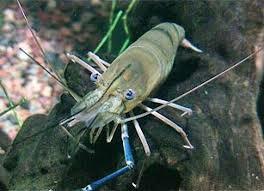 Prawns vary in colour from a dark red to an orange-red or pink; juveniles are sometimes green or brown. Running horizontally across their head are several white lines. They have a smooth, glossy body with an abdomen divided into several segments, the first and fifth bearing a distinctive white spot. They are a hermaphroditic species that begins life as male and becomes female in its later years. 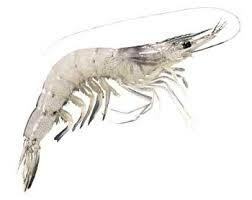 Prawns grow to about 20 centimetres, and live for four years. A Prawn trap or two. You can put two on one prawn line. Put enough weight in each trap to keep them from drifting or bouncing with the waves. A big Scotchman float with your name and number written on it. Some form of sinking rope. Either lead line, float line with a lead clip weight, or best of all a 100 ft. of lead line spliced to a longer float line. Length of line is determined by the location you will be prawning in. 450-500 ft. is standard for most parts of the coast. Bait Holders. Make sure you attach the bait holder to the middle of trap. If it drifts to the edge of trap the prawns will eat through the mesh of the trap and not find the tunnel into the trap. Prawn bait. Either prawn pellets, Carlyle cat food or a mix of the two. Don’t forget to soak pellets overnight in herring oil or commercial prawn attractant. Don’t fill the bait holder more than 2/3s full, as the pellets will swell and you want some water flow through the bait holder to spread the scent out. Prawn line clips to attach the traps to the rope. Attach the traps 30-50 ft. apart on the line using the prawn line clips. Make sure to tie a knot or loop at the end of the line so if the traps hang up they can’t slide off the end of the rope. Now you have to choose a spot to drop them. Your best option is to get directions from successful prawners, or identify locations by noting where you see other peoples Scotchman floats. If you have to choose your own spot take some time to examine you chart. Depth varies from region to region. Around Nanaimo most prawning takes place in 350-400 ft. of water. Around Ladysmith and Chemainus the water is generally shallower than most other regions so prawning is done in only 200-250 ft.
Make sure to have at least 100 ft. more line than the depth of the water you are in. Don’t be like the women that dropped her 100 ft. crab line in 100 ft. of water...at low tide, then came back to blame the store for the tide coming in. Look for a flat mud or sand bottom at the edge of a drop off. Try to land your traps at the lip of the drop-off. Be careful that they are on the bottom, and not over the drop off. Use a large Scotchman to float the entire rig in case you do drop it in too deep of water. The traps should sit upright on the bottom, so don’t just toss them overboard and let them drift to the bottom. Lower them down in a controlled way. Once you have set the traps, watch them for a little while to make sure the current isn’t going to drag them away. Also, keep them insight while fishing. Sometimes you might have to quickly pull it in when log booms are going to run it down. While some traps do get stolen, I think the majority of lost traps are due to high currents, and getting run over. Also dropping them in the ferries lanes is a good way to lose them. Once they have soaked for a few hours it’s time to haul them in. While an electric hauler is preferred, most people start out pulling by hand. Personally I never minded pulling mine by hand, until I tried using a line hauler. Now pulling by hand seems too much like work. However you do it, make sure to pull consistently without stopping. While pulling the prawns are pinned to the bottom of the trap, when you stop they can swim back and forth and some may get out. It can take many attempts to dial in a good location. Sometimes it can take years, but a good spot can produce hundreds per trap. Once you find a productive spot, mark it on your chart plotter. Remember to not go over your limit. Count each prawn as you clean them, and please release the berried (ones with eggs) ones. Take the heads off (the heads are great crab bait) on the water, and freeze them shell on in tap water filled tupperware. Frozen in a block of ice like this they will last many months in the freezer. I find they last longer than vacuum packed salmon, with little to no degradation in quality. We hope that the information provided on this page makes you a better prawn angler. In case you’d still like to continue your research into prawn fishing we put together the below list of 3rd party websites. They should be sufficient for expanding your knowledge base. Prawn – Wikipedia – Learn more about prawns on Wikipedia.